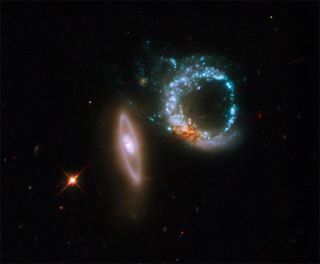 A pair of interacting galaxies called Arp 147 was captured by Hubble's Wide Field Planetary Camera 2. One of the galaxies (left-most galaxy shown) is relatively undisturbed, apart from a smooth ring of starlight. The other galaxy (right-most in image) exhibits a clumpy, blue ring of intense star formation. Afterovercoming a glitch that had forced science operations to cease, operatorswasted no time in using the Hubble Space Telescope to photograph anotherstunning cosmic scene. Thenew image, released today, shows an odd pair of galaxies called Arp 147. Inthe image, a galaxy at left looks somewhat like the number "1" and isrelatively undisturbed, but for a smooth ring of starlight. It appears nearlyedge-on to our line of sight. A galaxy at right, looking like a"zero," exhibits a clumpy, blue ring of intense star formation. Missionofficials suggested the image is a perfect "10." It shows thatthe observatory's Wide Field Planetary Camera 2 (WFPC2) is working exactly asit did before going offline. Theblue ring was formed after the galaxy on the left passed through the galaxy onthe right. Just as a pebble thrown into a pond creates an outwardly movingcircular wave, or ripples, an outwardly propagating ring of higher density wasgenerated at the point of impact of the two galaxies, astronomers explained. Asthis excess density collided with outer material that was moving inwards due tothe gravitational pull of the two galaxies, shocks and dense gas were produced,stimulating star formation. Thedusty reddish knot at the lower left of the blue ring probably marks thelocation of the original nucleus of the galaxy that was hit. Arp147 appears in the Arp Atlas of Peculiar Galaxies, compiled by Halton Arp inthe 1960s and published in 1966. Arp147 lies in the constellation of Cetus, more than 400 million light-years fromEarth. The Sept.27 failure of a vital data relay channel left the 18-year-old Hubble telescope unable totransmit the bulk of its science data and imagery. The channel, the Side Arelay of Hubble's Science Instrument Control and Data Handling system, had beenworking properly since the telescope launched in April 1990. Efforts toswitch to a backup Side B channel last week met with challengesof their own, with two separate glitches thwarting the initial attempt. Buta second try appears to have been successful, with Hubble engineersreactivating the telescope's main science instruments over the last week. The remotecontrol fix required engineers to power up and switch to backup systems thathad been hibernating since Hubble launched into space. Hubble'sSeptember data relay channel failure prompted NASA to delay a planned Oct. 14space shuttle launch to send seven astronauts to the orbital observatory on a fifthand final service call to the telescope. That mission is now slated to flyno earlier than February, with Hubble engineers testing a spare data relaychannel to see if it can be added to the shuttle's cargo bay and be installedduring the flight. Hubbleofficials are expected to give an update today at 5:00 p.m. EDT (2000 GMT) onplans for the servicing mission. The service call is expected to include fivespacewalks to add a new camera, upgrade guidance equipment, replace aging batteriesand gyroscopes, deliver a docking ring and include repairs for systems neverdesigned to be repaired in space. The finalHubble overhaul is expected to extend the space telescope's mission lifetimethrough at least 2013, mission managers have said.